UFO is an acronym for Unidentified Flying Object. It is used to describe any aerial phenomenon that cannot immediately be identified such as an airplane, helicopter, blimp, balloon, kite, or any other object that normally flies. UFO legends have become an integral part of modern culture, with UFO's being a recurring theme in movies, stories, and other forms of entertainment. Most UFO sightings are reported as an object or light seen in the sky or on land, whose appearance, trajectory, actions, motions, lights, and colors do not have a logical, conventional, or natural explanation. The reported speeds of UFOs vary dramatically. UFOs can hover silently for a long time then instantaneously fly off at great speeds--certainly much faster than publicly known conventional aircraft. They can move slowly across the sky, or perform unbelievable maneuvers, such as right angle turns, at incredibly high speeds with sudden stops. The term UFO was coined in 1952 as part of Project Blue Book's attempt to categorize and investigate a surge in sightings of unusual, unidentified objects flying across North American skies in the late 1940's. Although the term UFO was meant to disassociate the phenomenon with the vagueness of the previous terms “flying saucer” and “flying disk,” the coinage of an official acronym only increased the ambiguity. 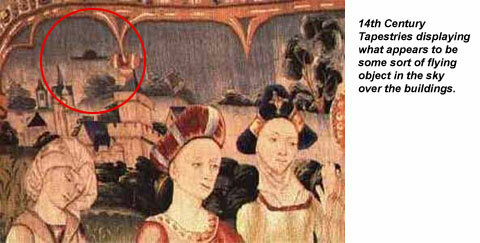 Reports of unidentified aerial phenomena date back to ancient times. There are many myths, legends, and stories that tell of strange things seen in the sky or beings who came from the sky to help humans develop civilization. Modern reports and the first official “public” investigations began during World War II with sightings of so-called “foo fighters” by Allied airplane crews. They described these UFOs as glowing balls of light that flew beside their planes. In 1946 there were numerous sightings over Sweden and Norway that became known as "ghost rockets". Only after the war did they discover that German pilots had also seen the glowing lights, which were thought to be American or British secret devices! UFO reports became even more common after the first widely publicized United States UFO sighting, by private pilot Kenneth Arnold in mid 1947. Hundreds of thousands (possibly even millions) of UFO reports have since been made. One theory suggest that UFOs are spacecraft built and operated by advanced alien races, whether they came from space, the hollow earth, the ocean or other dimensions. 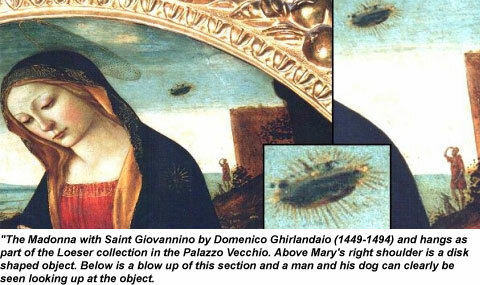 Some believe that UFOs are not space vehicles at all - claiming another type of government controlled device, used to create a holographic image that people see in order to keep humanity in a fear = control state. Another possibility is that what people see as UFOs are portals or "wormholes" that connect different parts of our space-time continuum and are used by intelligent beings to move between different points in space-time. Other theories state that UFOs are explained by unusual natural phenomena, such as mysterious ball lightening appearances, or are proponents of the "earthlight theory" arguing that geological stresses in the earth's crust produce glowing balls of ionized gas that are ejected into the atmosphere. Many believe that our government has reverse engineered many extraterrestrial crafts that have crashed on earth, making it impossible to tell whether they are test crafts or actual bona fide UFOs. 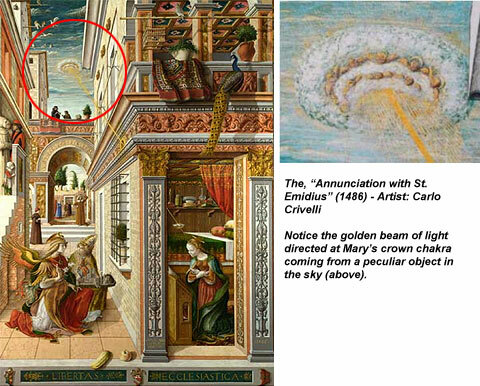 Believe it or not, there are numerous depictions of Unidentified Flying Objects in historical religious art. 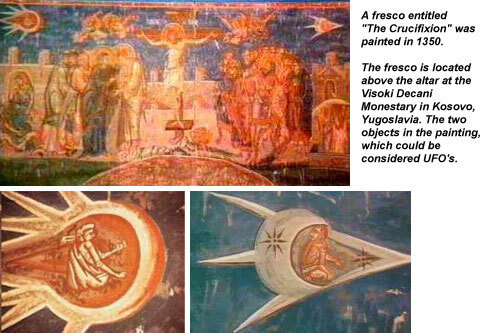 Many illustrations are of flying saucers, glowing spheres in the sky, and beings riding in flying objects. A few examples are displayed below.